At first appearances, the Honda Integra appears similar to a maxi-scooter. This two-wheeler is a motorcycle hiding under the scooter disguise. This machine shares the chassis and the engine with its brethren NC750X. The Honda Integra provides a few clues to show it is not a maxi-scooter. For example, the wheels are 17 inches and has sprockets and chain in-lieu of the traditional enclosed drive assembly as found in scooters. 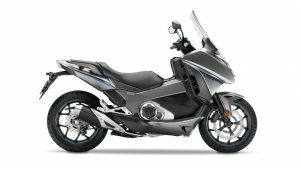 The latest model has many changes which Honda explains is given to improve the quality and make it more like a bike. The exhaust silencer is a newer version, clearly designed to make this two-wheeler improve its sound along with style. Also new are the forks. These are the 'Dual Bending Valve' ones with internal damping system manufactured by Showa. Another new item is front brake calliper. The multi-coloured LED dash, and the LED rear and front lights make a welcome addition. When the fairing of the Honda Integra is lifted, the motorcycle technology is clearly visible. The ride, however, is not like that one of a bike. Both the ride position and seating are like a maxi-scooter- comfortable, accommodating, relaxed and the rider can stretch forward the feet. When the Honda Integra moves, it feels excellently balanced. A city commute becomes an enjoyable activity. The suspension makes it a joy to ride on swooping roads. The bike feels stable and assured compared to the average two-wheeler. The Honda Integra when ridden on dual carriageway offers good wind protection. This is due to the front fairing, shielding the legs from wind blasts. Screen offers an excellent protection too, depending on the rider's seating position. For shorter people, the top of the screen comes to eye level. The Honda Integra has a 745cc parallel twin engine powering it. The engine is as same as NC750X. The engine makes 54hp at about 6,250rpm. The engine makes 50lb/ft torque at about 4,750rpm. This bike is exclusively DCT and the effect is of twist and go two-wheeler. 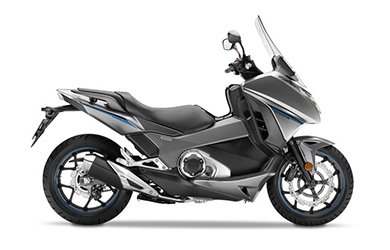 The DCT gearbox of the Honda utilizes two clutches to offer smooth gear changes. A specific clutch is entrusted with the odd gears, while the remaining one is responsible for the even ones. The clutches engage and then disengage to make extremely smooth shifts. Drive is not lost during the changes. If there are manual change of gears, there is no requirement to shut throttle for up and down changes. Since there is no CVT transmission, there is no laggy response which is characteristic of a scooter. The Honda Integra feels keen and responsive. The engine performs superbly in automatic mode. The motorcycle rides with precision. The DCT can be placed in manual mode, if preferred by the rider. Both the Sport modes and the Drive modes can be overridden if needed. Most riders take the Sport mode option as the default one for a superb trouble-free ride. The suspension of this motorcycle is an excellent one.